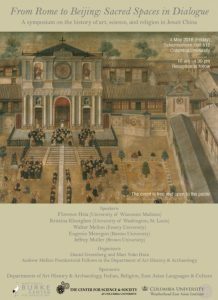 On May 4, Columbia University hosts “From Rome to Beijing: Sacred Spaces in Dialogue: A Symposium on the History of Art, Science, and Religion in Jesuit China.” Daniel Greenberg and Mari Yoko Hara, both Andrew Mellon Postdoctoral Fellows at Columbia, have organized the event. Menegon is also a Collaborative Scholar at the Institute for Advanced Jesuit Studies, and Muller was a Senior Research Fellow at the Institute in the fall of 2016. Abstracts for the presentations are available online. “From Rome to Beijing” is sponsored by Columbia University’s Dept. of Art History and Archaeology, Dept. of Italian, Dept. of Religion, and Dept. of East Asian Languages and Culture, the Mary Griggs Burke Center for Japanese Art, The Center for Science and Society at Columbia University, and the Weatherhead East Asian Institute. Additional information is available at the Weatherhead East Asian Institute’s website. A one-page summary of the event is available online.